The human sciences are comprised of a broad range of specializations, each with a unique focus that contributes to a multifaceted understanding of the challenges we face. Collaborations between and among these specializations offer deeper insight and more informed solutions as we strive to improve the health, well-being, and livelihoods of individuals, families, communities, and the world itself. These resources help begin those conversations, and provide a platform for collaborative teams to share the results of their efforts with the broader human sciences community. The Human Sciences Working Papers Archive is a KON Minisite designed to facilitate communication across the human sciences, to stimulate comment, and to make ideas quickly available. Papers are all intended for eventual publication in refereed journals or collected volumes. Authors have access to readers and feedback while students, professionals, and the public gain access to timely new ideas and resources. Individuals, professionals, and society benefit from the enthusiastic participation of authors and researchers. Kappa Omicron Nu members, both students and alumni, are strongly encouraged to reach out to younger students and professionals by sharing the benefit of their experiences. Join us today by participating in our social media channels. As we strive to support one another and build a deeper sense of community, we need your voice to be part of the conversation! Active Kappa Omicron Nu members are invited to join together to lead scholarship in our field by serving on the Kappa Omicron Nu board or a committee. We rely heavily on collaborative leadership among our members to guide the tone and direction of our organization in ways that will enhance student learning and build a new generation of leaders for the human sciences. 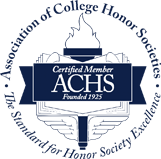 As a certified member of the Association of College Honor Societies, Kappa Omicron Nu chapters are eligible (and encouraged) to participate in the ACHS Honors Council Grant Program. The program encourages the development of collaborative campus Honors Councils among certified honor society chapters to enhance university-wide collaboration on co-curriculum high impact practices, functional organizational activities (organizational business and meetings), and support for honor society advisers and officers. Four $1,000 grants are available for pilot projects to achieve these objectives. Examples of Honors Council activities include service-learning, faculty-mentored cross-disciplinary undergraduate research, undergraduate research conference, peer mentoring, peer tutoring, service projects, campus ambassadors for high school senior day, honor society award ceremony, multiple honor society inductions, honors day recognition program, career day, jointly sponsored speakers, recognition of faculty, professor of the month recognition, involvement with alumni, and others of a similar nature. Honors Council activities should contribute to engagement and leadership development and, ultimately, to great jobs and great lives (Gallup/Purdue University Index Report, 2014).